This schematic from the article shows sonar beam pattern reconstruction for one bat. The vocalizing bat (color black) produced one vocalization. Each gray vector shows the intensity of this sonar emission received by each microphone on the array, and the direction of the sonar beam axis (thick black vector) indicates the direction of acoustic gaze. The sonar beam axis is the sum of these 16 intensity vectors. 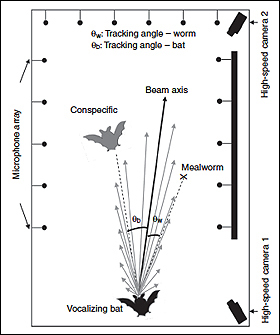 The tracking angle to the bat is the angle between the other bat and the sonar beam axis, while the tracking angle to the worm is the angle between the tethered mealworm and the sonar beam axis. A team led by ISR postdoctoral researcher Chen Chiu has published an article examining competition among bats in the October 2010 issue of the prestigious Journal of Experimental Biology. “Effects of competitive prey capture on flight behavior and sonar beam pattern in paired big brown bats, Eptesicus fuscus” explores the strategies bats use to track and catch prey—and to track each other—when they are competing with other bats. In addition to the lead author Chiu, the team included Puduru Viswanadha Reddy from the Department of Econometrics and Operations Research at Tilburg University in the Netherlands, Auditory Neuroethology Laboratory Research Assistant Wei Xian, Professor P.S. Krishnaprasad (ECE/ISR) and Professor Cynthia Moss (Psych/ISR). Surprisingly, one of the findings was that as bats chase each other and perform maneuvers to gain advantage, a bat trailing another actually has the competitive advantage in capturing the prey. Read a short summary of the research at the Journal of Experimental Biology website. Or download the full article.